Paneer Pasanda – Another version of Cottage cheese Paneer which will just take you to the dreams of paradise.The dish is made with Paneer slices stuffed with dry fruits dipped in rich gravy of tomato and cream. Take out 1/4th of total Paneer. 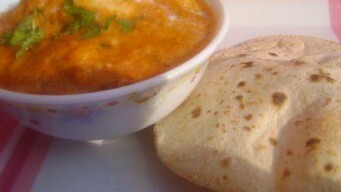 Mash this 1/4 paneer into tiny small pieces using your hand or a spoon. Divide the rest 3/4 Paneer into triangle shaped pieces with about an inch of height. Once you have the pieces, mark a cut at the center in a way that you can stuff something inside this cut. The piece should have its one of the side un-cut. Add mashed Paneer in a bowl along with Raisins, 1/4 tsp Salt and 1/2 of your Ginger Grated. Add 1/2 of your White pepper powder and 1/2 of crushed Cashew nuts. Mix well. Stuff a tsp of this mixture in each of the Paneer pieces that we made earlier. Heat Oil on high flame in a frying pan for about 2 minutes. Add Corn flour in a bowl along with 1/4 tsp of Salt. Mix it to make a thick paste using sufficient warm water. Corn flour paste should be thick enough to cover the Paneer piece’s outer surface completely. Dip the Paneer piece completely in corn-flour paste and fry in hot Oil. Fry all pieces until they turn light golden brown from both sides. Paneer pieces are now ready. Keep them aside. Lets start making gravy. Take a pan, add 2 Tbsp Oil switch ON the stove on high flame for about 2 minutes. Add Onions and shallow fry until they turn light pink. Once they turn pink, take them out and keep aside to cool down. Do not throw away the left-over Oil. Slice Tomatoes into 4 pieces each and shallow fry in the same Oil. Once you see them softening, take out and keep aside for cooling down. Now, grind fried Onions, Ginger and garlic together to a fine paste. Grind Tomatoes separately to a fine paste. At this point, you should have 2 separate paste: One is with Onion-ginger-garlic and second is with Tomato. Submerge Cashew nuts in water to help them soften for 2 minutes. Crush them to a fine powder/paste after 2 minutes and keep aside. Chop Green Chili into small pieces. a pan, add 1 Tbsp oil and heat it for 2 minutes. Add Bay leaves, big and small cardamom, Cloves, Black pepper seeds, Cinnamon and cook it for 30 seconds. Add Onion-ginger-garlic paste and cook on medium flame until it turns golden brown. Now, Add Tomato paste and Green Chili. Cook for 1 minute. Add Coriander powder, Turmeric, Red Chili and White pepper powder and Salt. Let the paste cook until it gets one boil. After a boil, add crushed Cashed nuts and Cream. Mix well. Add 1 Cup Our 1 Cup = 240 ML Water and cook for 5 minute on medium flame. Add fried Paneer pieces and mix well with Gravy. Switch off the stove. Paneer Pasanda is ready to serve. Garnish with Coriander leaves before serving.